Artworks created by Indian artists for British soldiers and officials provide a fascinating insight into early Anglo-Indian relations. These vibrant and colourful works paint a picture of the British experience on the Indian subcontinent in a pre-photographic age. Britain fought wars in India throughout the 18th and early 19th centuries to protect trade and enlarge its territories. During this period a significant number of British military officers and administrators became captivated by India, studying its languages, recording its history, religions and culture, and collecting Indian works of art. Some even adopted Indian dress and customs. Professional Indian artists were well-known at military stations and at traveller stops. They sold ready-made works and undertook commissions. Paintings made by Indian artists for the British were known as ‘Company paintings’ because they were created during the era of East India Company rule in India and often made for its employees. The trend of Company painting emerged around 1770 but declined in the 1840s, after photography was introduced to India. 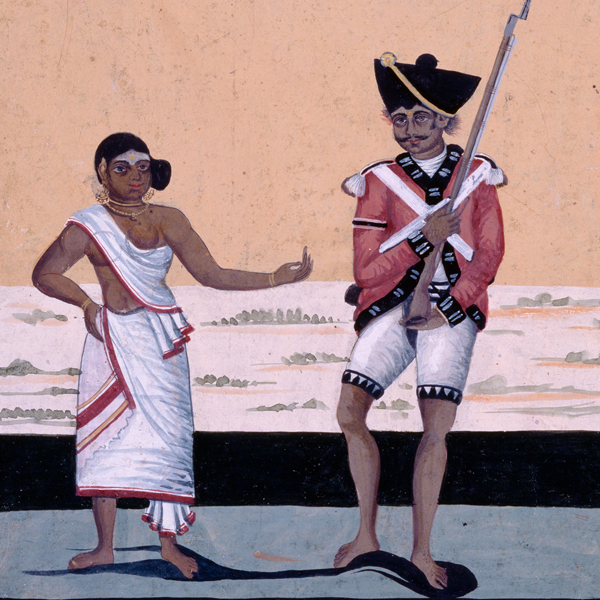 Indian soldiers were popular subjects for Company paintings as they appealed to the British officers in India. Such paintings provide a unique perspective on how Indian artists viewed the Indian soldiers serving in the Bengal, Bombay and Madras armies. The style of many of these paintings was intentionally designed to appeal to European tastes, showing exotic people, uniforms and picturesque landscapes. 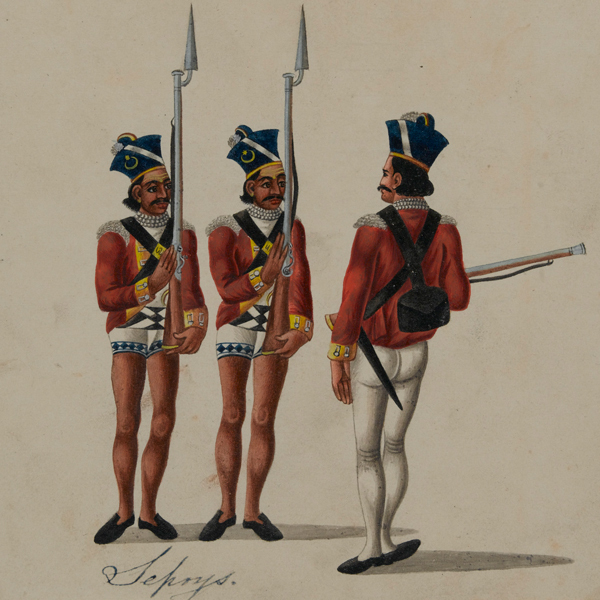 The paintings often showed examples of different ranks and regiments of the native armies. Some showed castes and occupations too, and most would usually include generic examples of a sepoy (infantry private) or sowar (cavalry trooper) from the area the artist worked in. The painting above shows a golandaz (artillery private), a sepoy and a subadar (senior Indian officer). Although paintings of Indian soldiers made popular souvenirs, they also tell us about the customs, dress and traditions of the predecessors of the Indian Army. The intricate details illustrate the differences in uniform and equipment between different ranks. One of the figures in this painting wears trousers rather than shorts, showing that he is a senior officer. The Company tried to accommodate the local customs of its men. Indian soldiers were permitted to wear jewellery and bead necklaces. The Bengal Army regulations of 1799 stated that there was ‘no objection to the Native officers and Sepoys wearing beads round their necks; but they must be uniform, and the men be permitted themselves to furnish them’. The caste marks on the foreheads of this sepoy and his wife show that they are Hindu. In 1806 the Madras Army offended both Hindu and Muslim soldiers when it banned the wearing of caste marks and required Muslim soldiers to shave their beards. The resulting mutiny at Vellore demonstrated that the Company needed to respect the customs of its men. The new regulations were soon abolished. As well as paintings, Company artists cashed in on the 18th century fashion for figurines of soldiers. The bronze elephant above was made around 1795 and is part of a set that shows troops with uniform and equipment from the time. 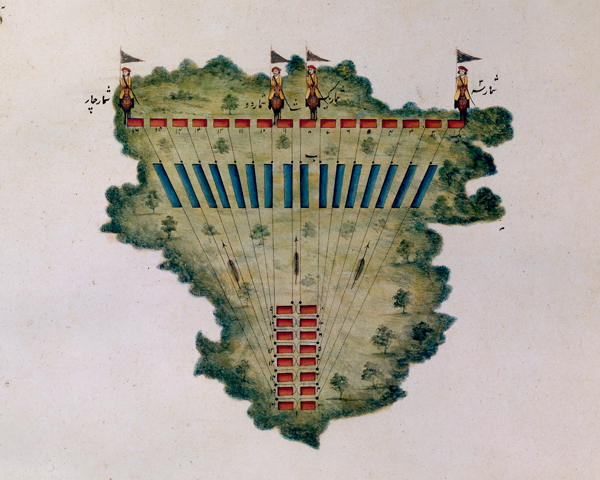 The set represents East India Company forces and those of an Indian ruler. 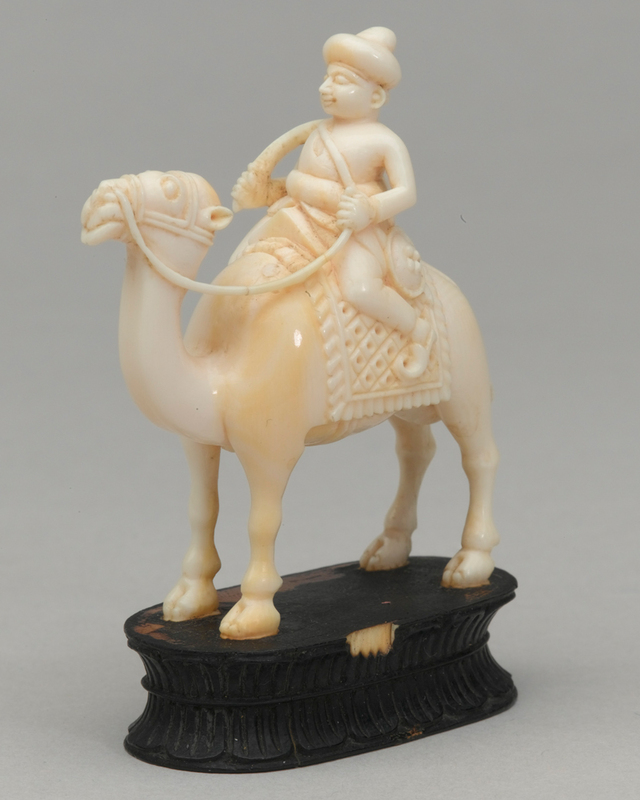 It would have been made for a high-ranking Indian or British patron as it was made in Vizigapatam (Visakhapatnam), a city famous for the quality of its works of art, including ivory, bronze and silver. Entrepreneurial Indian artists realised that they could sell popular subjects to tourists passing through the major attractions. Company paintings and souvenirs did not become popular in towns and cities without monuments that attracted British visitors. This soldier is from a set that shows different ethnic groups of the Madras Army. The beautiful wooden figures were probably toys, which is why their weapons are missing and their paint is worn. 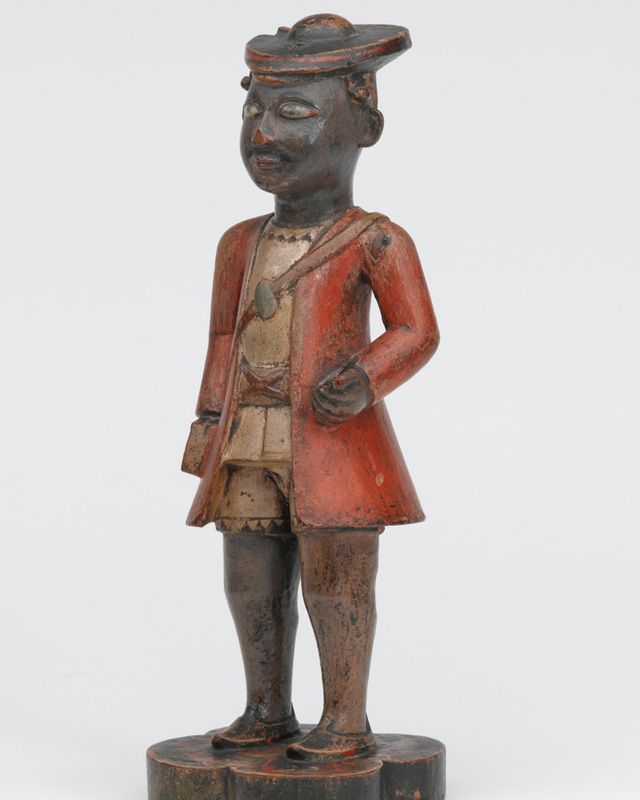 Very few Company school wooden figures have survived from the 18th century. This example was made in Hyderabad. 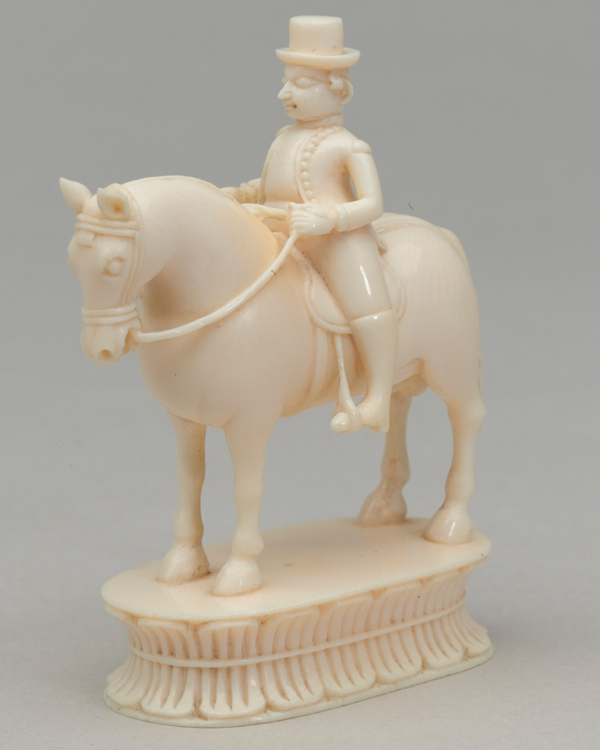 Finely-crafted chess sets of East India Company and native soldiers were also popular souvenirs. This set, depicting the Bengal Army and an Indian ruler's forces, was probably made in Berhampur, a famous centre of ivory carving. It was ideally situated for the European market because travellers and traders passed through on their way to and from Calcutta and central and southern India. It was also a garrison town, so would have had a regularly-changing population of British officers. Company artists also painted special events. Processions, festivals and durbars (traditional Indian court meetings or receptions) were all popular subjects for British patrons. The painting above depicts the 1840 durbar of Rajah Sivaji, ruler of Tanjore, which was attended by Lord Elphinstone, the Governor of Madras. It shows Western influence in its handling of perspective, but also Indian qualities in the detail, colour and delicacy - such as in the carpet in the foreground. The artist here uses the lines of the picture to draw the eye towards Sivaji seated on his throne. Such paintings give us a record of important meetings between key figures, and provide an insight into the way that Anglo-Indian diplomacy was conducted. This painting, by the Delhi artist Ghulam Ali Khan, shows Colonel James Skinner (seated centre left) holding a regimental durbar in 1827. This was an occasion for any soldier to raise his concerns to his commanding officer. 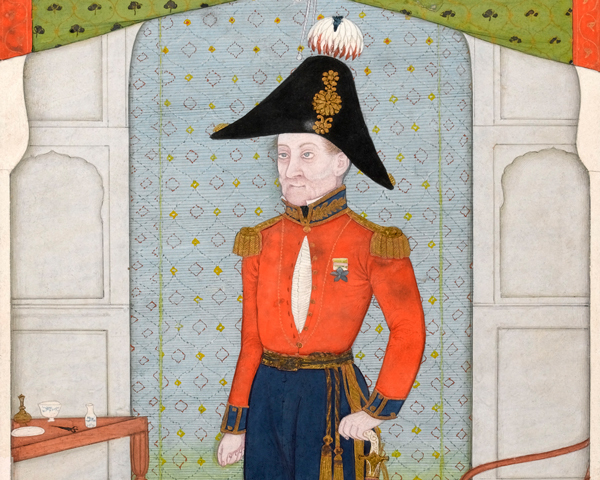 It tells us that Skinner mixed freely with his men, and was conscious to uphold Afghan and Mughal traditions, in order to give his soldiers a sense of upward mobility within the East India Company. This painting is also exceptional because nearly all of the figures are named in gold, with their rank or role. This makes it possible for us to identify the men who served with Skinner, and get a sense of what they looked like. The first seated man on the right-hand side is Duffadar (cavalry sergeant) Ganga Sankar, the only Hindu soldier present. He wears a necklace of beads and a tilak (religious mark) on his forehead. Portraits by Company artists of named British officers are much less common than figure studies of Indian soldiers. This portrait of General Sir John Littler was probably commissioned by the sitter in 1848. It is highly decorative and typical of the Punjab style. Littler fought in the First Sikh War (1845-46) and then remained in command at Lahore for several years. Not all famous patrons commissioned works of art for vanity. Colonel James Skinner (1778-1841) employed artists to paint local life, and as a famous cavalry commander, commissioned works to demonstrate tactics to his troops. He was the son of a Scottish officer in the Company's service and a Rajput lady. He raised two cavalry units for the British, later known as 1st and 2nd Skinner's Horse. They were famous for their horsemanship and skill at arms. Skinner was well rewarded, enabling him to acquire a town house in Delhi and a large estate at Hansi, Haryana. He maintained a close interest in Indian culture and was an important patron of the arts, commissioning a number of paintings recording his life and exploits. Skinner produced a personal manual of cavalry manoeuvres for his officers. 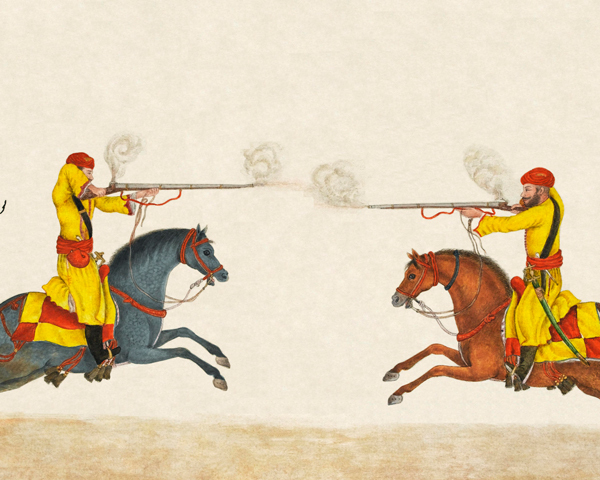 'The Book of rules for the Manoeuvres of the Hindustani Musket Cavalry formed by Colonel James Skinner Sahib Bahadur' published in 1824 was based on his experience of commanding cavalry. It was written in Persian and Urdu, and detailed British and Indian cavalry manoeuvres, combining the merits of both. The manual was illustrated in beautiful detail by a Company artist. Explore more about Black and Asian members of the British Army in the National Army Museum's Collection. Discover how the cultural relationship between Britain and India has influenced our language. In Victorian Britain, it was the news of war rather than the antics of minor entertainment celebrities that boosted sales of newspapers.